Spring is almost here and if you’re like me, you’re ready to start decluttering your home, opening the windows to let the sunshine in! 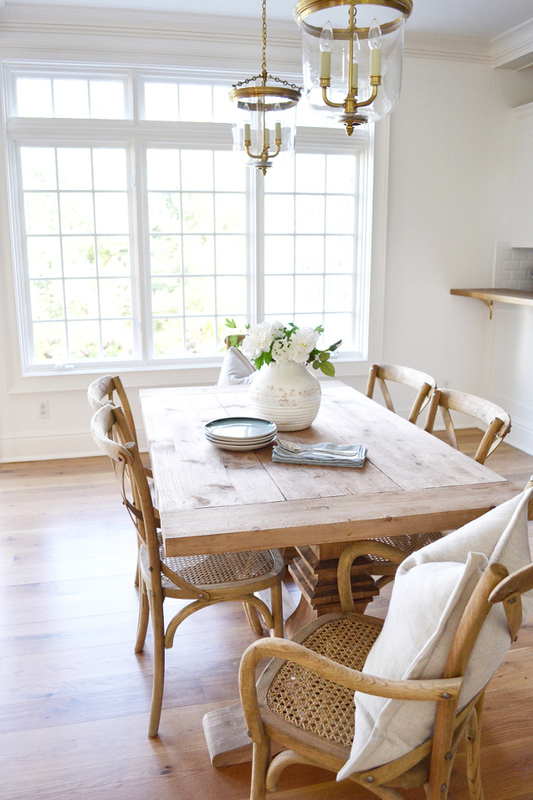 For me, Irina’s home, from @HomeSweetHillcrest, is the best example of warm decluttered interiors I’ve seen in a long time and trust me, that’s not always easy to do. Here you will see how Irina found the perfect balance to design a home that feels calm and serene without lacking personality. My husband and I met and started dating as teenagers, so we have grown up together and wanted the same things out of life for a long time. We both went to college in Connecticut and after we graduated we spent time in NYC and DC. We were living in Manhattan when we got married and had our son, but we always knew we wouldn’t stay in the city forever. There are quite a few options when choosing to move to the burbs, but our hearts were set on getting back to CT from the start. We really didn’t look anywhere else as we fell in love with Fairfield County. It’s so beautiful and you really get the best of everything – beaches, farms, hiking trails, five star restaurants, tons of shopping, and the city so close by. There is so much to do here and the community is so welcoming! We LOVE it and couldn’t see ourselves anywhere else. 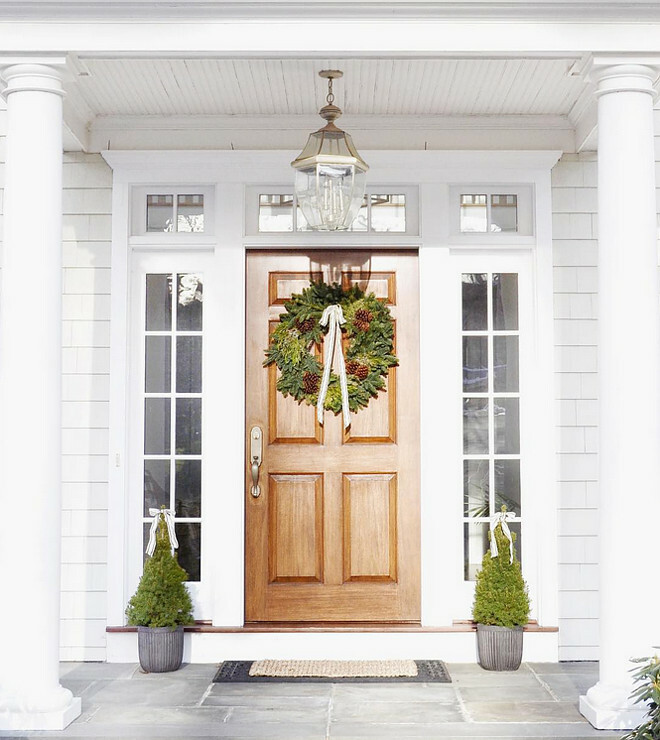 What I adore about our home is that it embodies the quintessential New England vibe, which we have stayed true to in the design. When we bought our house it had great bones and was 10 years old, so fairly new, but style-wise it was outdated. 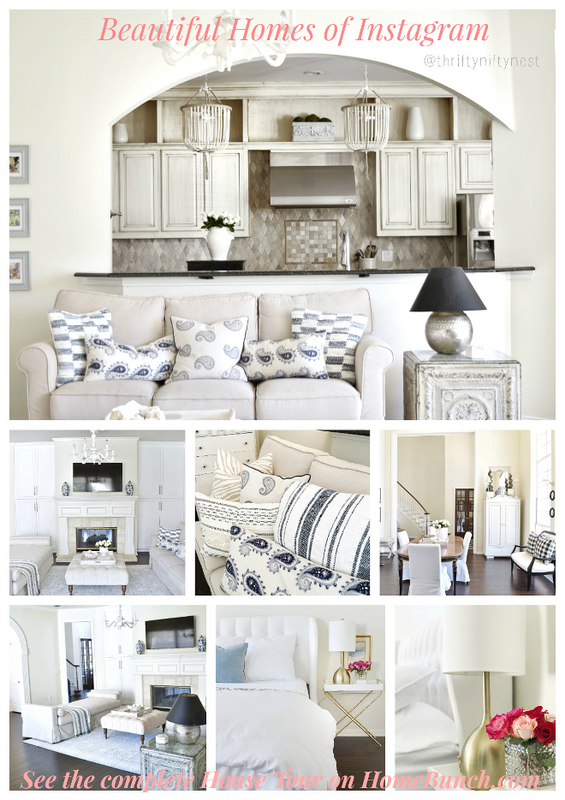 Our vision was to keep it simple and update our colonial with touches of coastal/glam/traditional design. It made sense in my mind, and I do think we achieved this with the renovations that we made. You will see coastal details through the color palette and fabrics which are comprised of neutrals and navy blues. 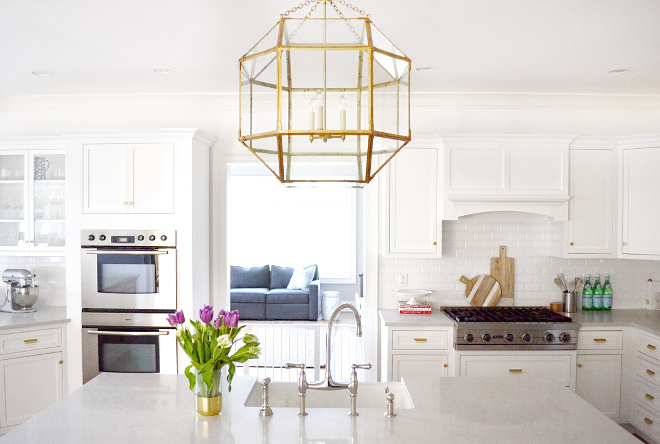 I’ve always been a fan of jewelry, and I was not planning on pumping the breaks when it came to the shiny details in our home. My husband always makes fun of me for saying “lighting is the jewelry of the home”, but it is so true – it can make a room! We swapped out all of the lighting and mostly switched to brass, which I love! 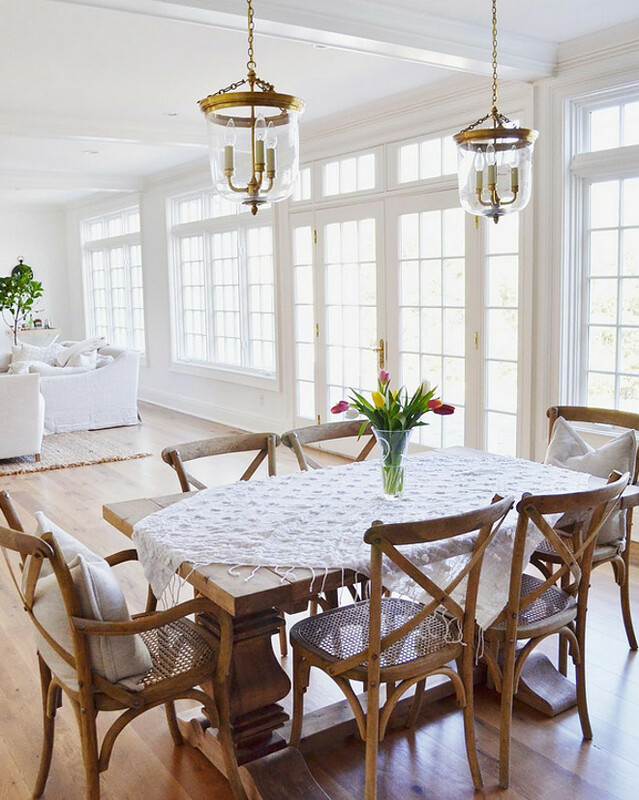 It really warms up all the whites and light colors in the house. When it comes to styling I think you will see that I like to keep it simple and clutter free. I’m definitely a less is more kind of girl and truly believe in letting one or two beautiful pieces do all the talking. We still have a lot of projects in the works and this Spring we will be tackling the exterior and landscaping (I can’t wait). We are so excited for what’s to come and so happy with the progress so far. I hope you all like it as much as we do! You can’t help but falling in love with Irina’s home the moment you step in. Isn’t this space beautiful? What a great energy! The door is painted in Benjamin Moore Midnight Oil. The foyer light is the Large Darlana Fancy Lantern in Gilded Iron from Circa Lighting. 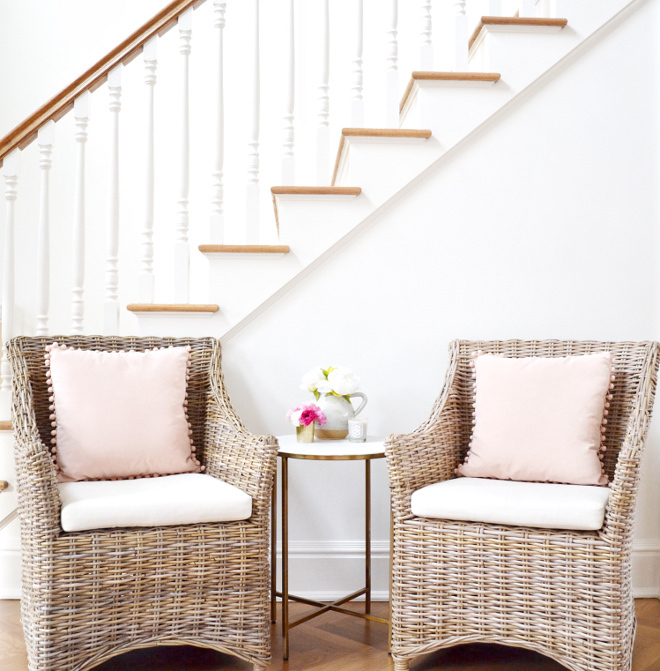 Walls, trim and staircase spindles paint color is Benjamin Moore Simply White. 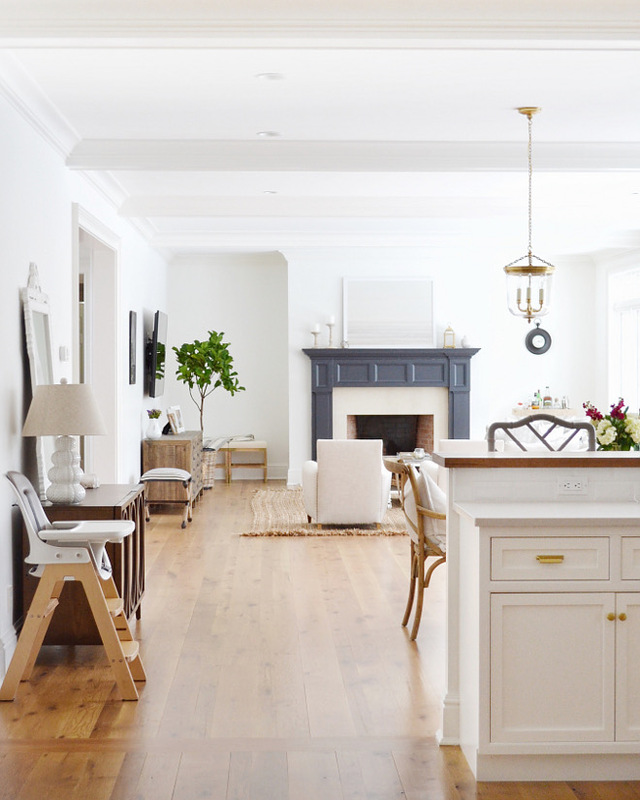 I chose the same color for the walls and moldings in this white because I like its crisp clean look. The moldings are one of the features that drew me to our home because they are so detailed and grand. We were lucky we didn’t have to change anything there. 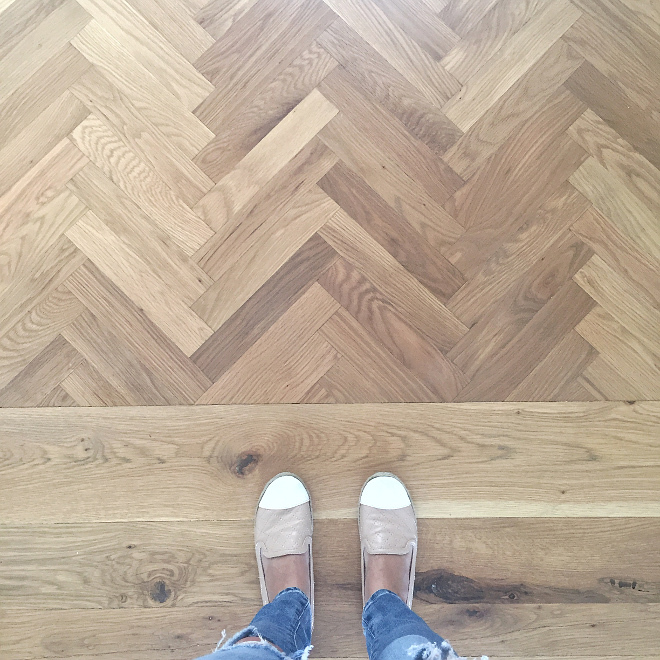 My favorite part of our foyer is the herringbone wood floors. All the wood floors are white oak which we sanded down and re-stained. It took a few tries to get it right, but we are so happy with the end result! They are a custom blend of Minwax driftwood and pickled oak. 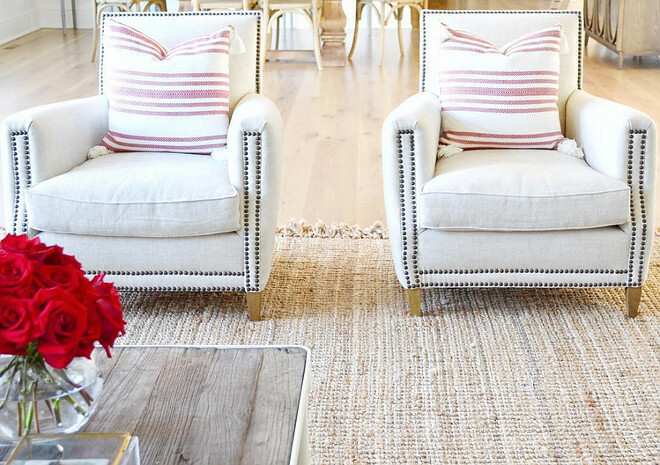 The wicker chairs are from Overstock and the marble table is from Target. 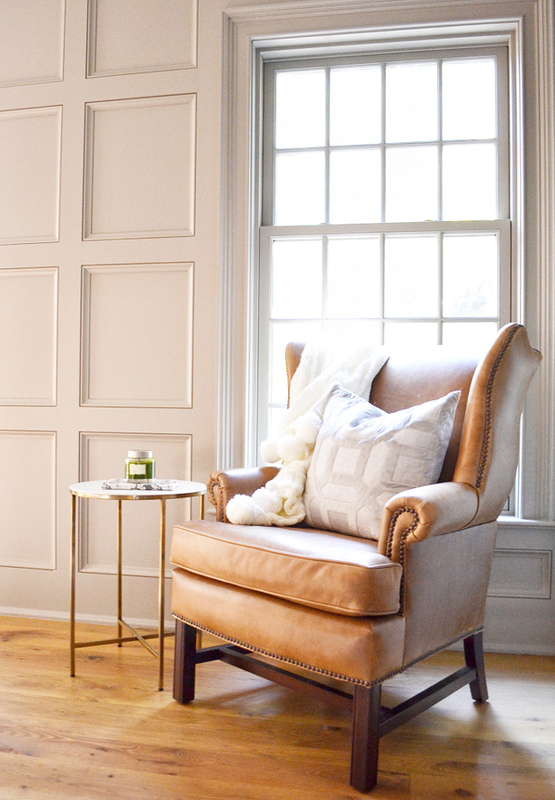 Walls are Revere Pewter HC-172 by Benjamin Moore. One day soon I plan on doing a bold wallpaper in this space to really make it pop. All furniture is from Restoration Hardware. Grand Baluster Rectangular Extension Table 84 inches wide in Weather Oak Drifted. Vintage French Square Fabric End Chairs in Sand and Weathered Oak Drifted. Vintage French Square Cane Back Fabric Side Chair in Sand and Weathered Oak Drifted. The French chandelier is from Horchow and vase is from Pottery Barn. The rug is the Silky Road Medallion AS14 Rug from Rugs USA in 9×12. Cabinet is the Restoration Hardware Hampton Casement 4 Door Glass Sideboard and Hutch in Distressed White. I had to have a white kitchen! Especially since there isn’t a window directly in the kitchen, I wanted to find ways to make the space feel as bright as possible. Knocking down the living room wall and choosing light colors for the finishes helped achieve this. Appliances: Fridge is Sub Zero, Stove is Viking, Ovens & Dishwasher are Bosch. The peninsula has an oak wood counter stained to match the floors. 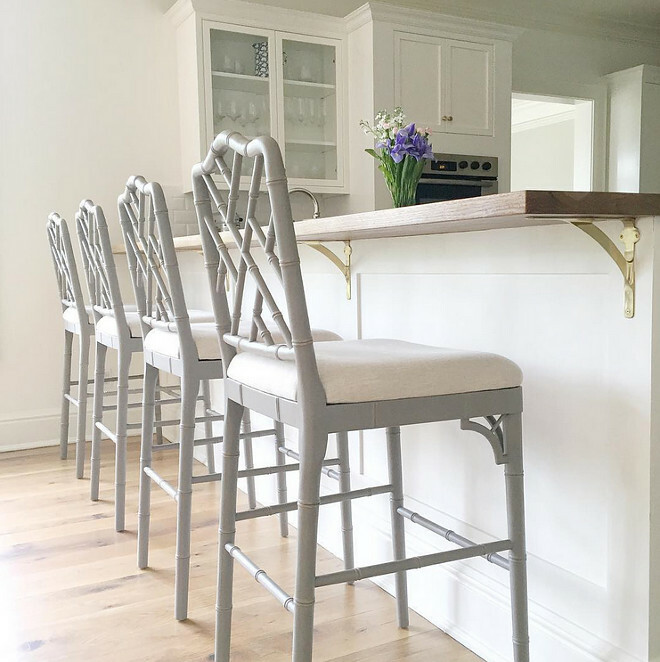 The grey barstools are from Ballard Designs. The original inset cabinetry was great, but the style of the doors and beige color were outdated. According to our contractor we saved almost $25k by just replacing the doors to shaker style and repainting as opposed to installing all new cabinetry. The cabinets were sprayed Benjamin Moore Simply White to match the walls. 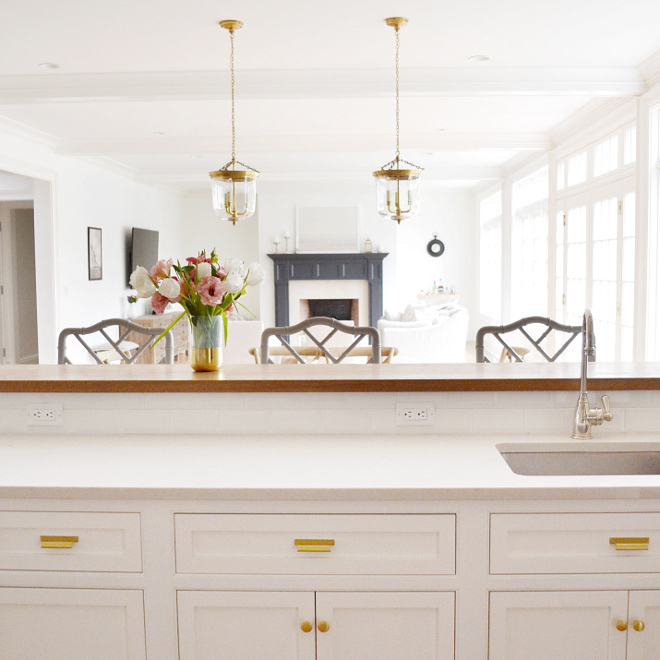 The cabinets were sprayed Benjamin Moore Simply White to match the walls. 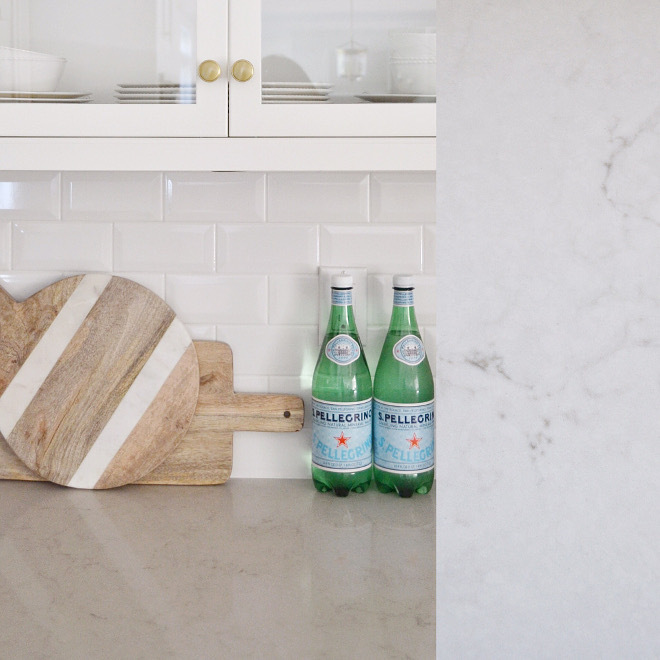 I debated long and hard about getting marble for our kitchen (I know a lot of people have this dilemma). I love the look so much, but I can’t deal with the maintenance so I did tons of research on alternatives. We ended up choosing Caesarstone in London Grey and we are SO happy with it. It is so easy to maintain and has beautiful light grey veining to it. It’s tough to really see how lovely it is in pictures but I think it’s perfect for our kitchen and family (we eat a lot of marinara sauce here)! 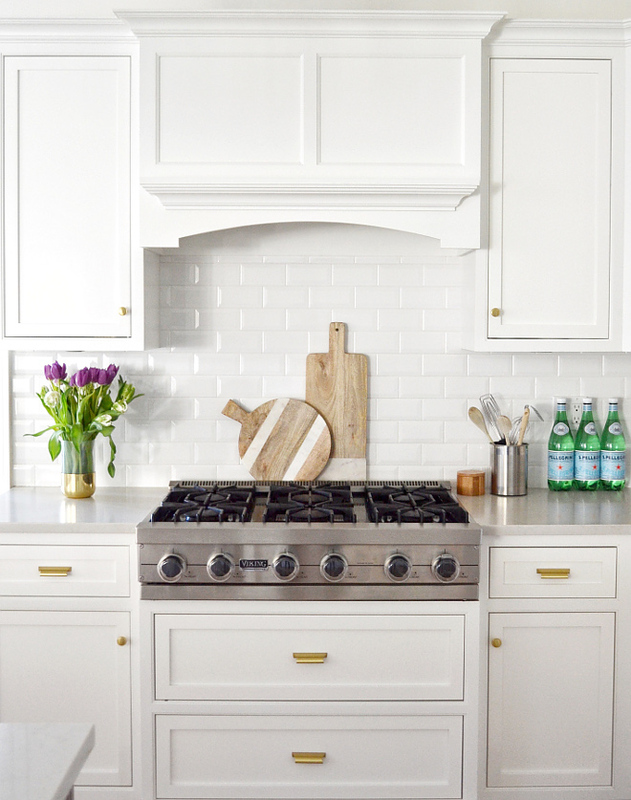 Backsplash is 3×6 beveled subway tile in Pure White. The original island was a bit beat up, so we decided to get a brand new one and have some contrast with the color against all the white. The brand is Decora Cabinets and the wood is Oak in a Fog finish. The island is 87.5 by 38 inches. 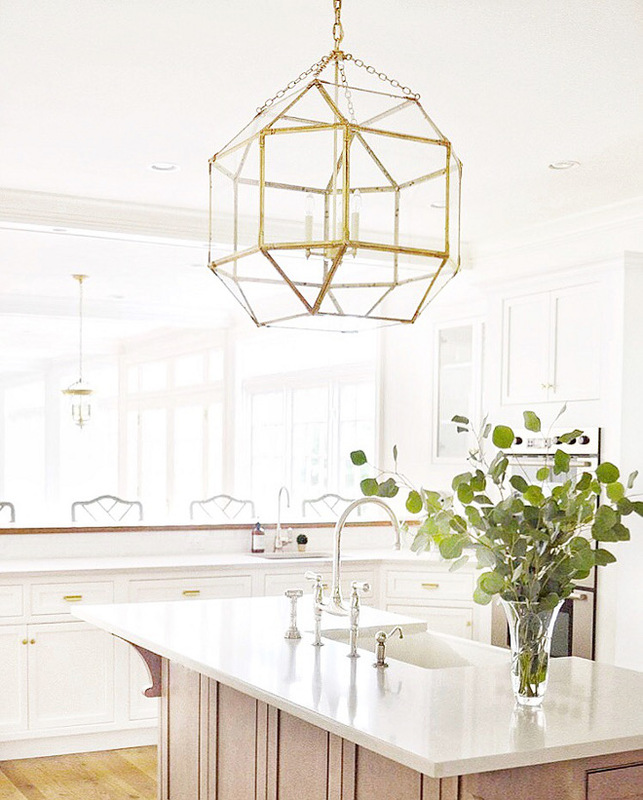 The light over the island is the Suzanne Kasler Morris Large Lantern in Gilded Iron with clear glass. 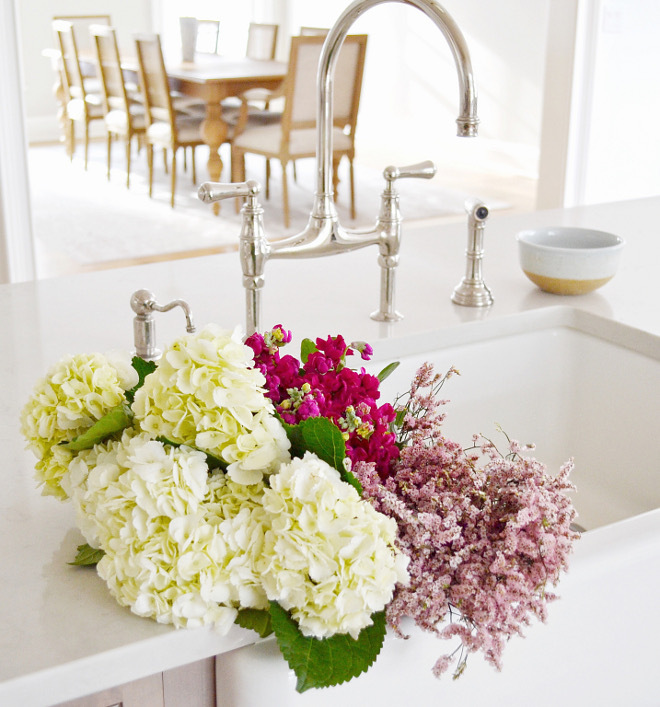 The white farmhouse sink is from Kohler. 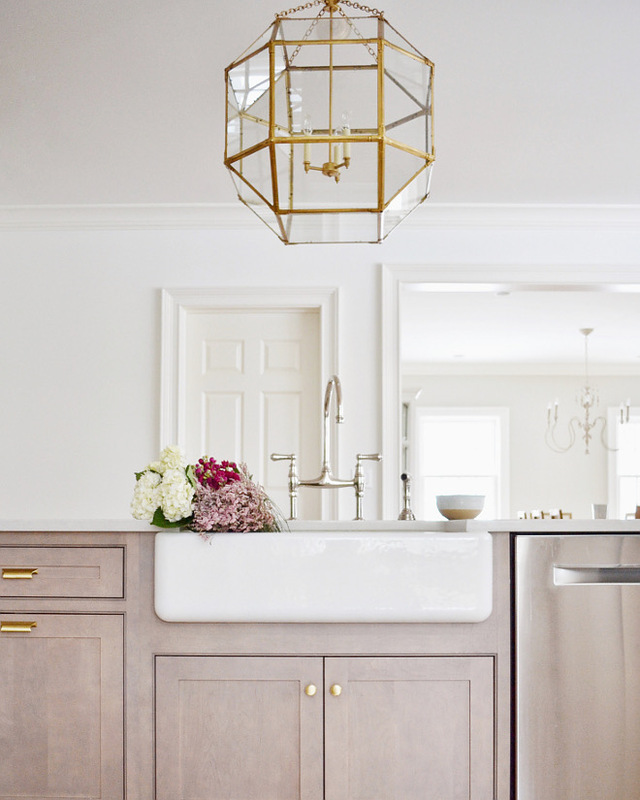 Aside from the lighting, the kitchen faucets are one of my favorite details in our home, they are so pretty! I’m a big believer in spending a little extra for certain pieces that will stand out, and lighting and faucets are where it’s at! Faucet is Perrin and Rowe in Polished Nickel. 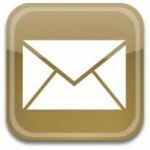 The hardware is from Colonial Bronze in a Satin Brass finish. The pulls are style #435 and the knobs are #138. 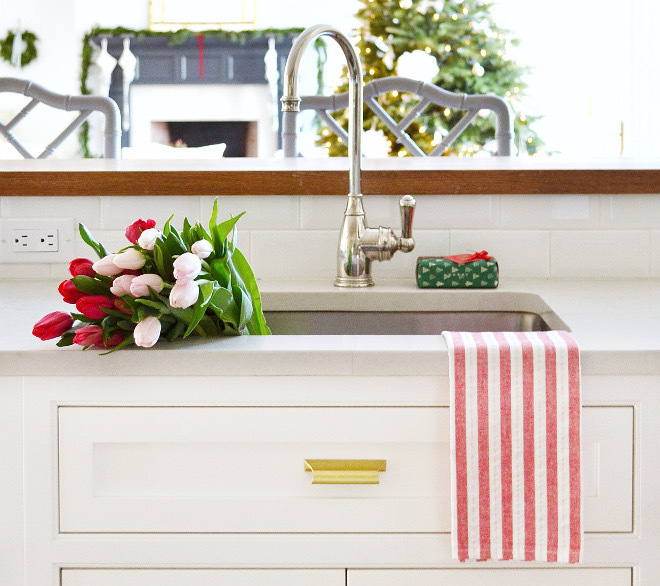 The prep sink is by Kohler. Floors are alternating sized white oak wood, stained in a custom Minwax stain. 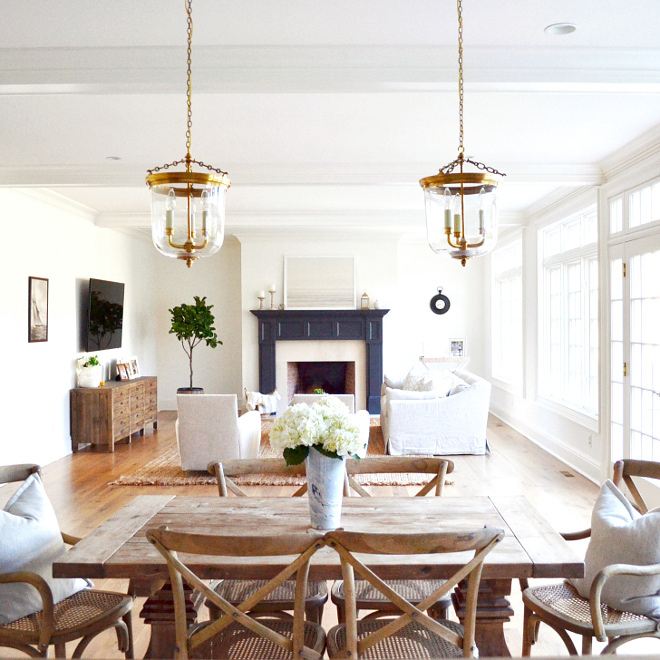 Breakfast area opens to the family room and it has a pair of Thomas O’Brien Merchant Pendants in Brass from Circa Lighting. 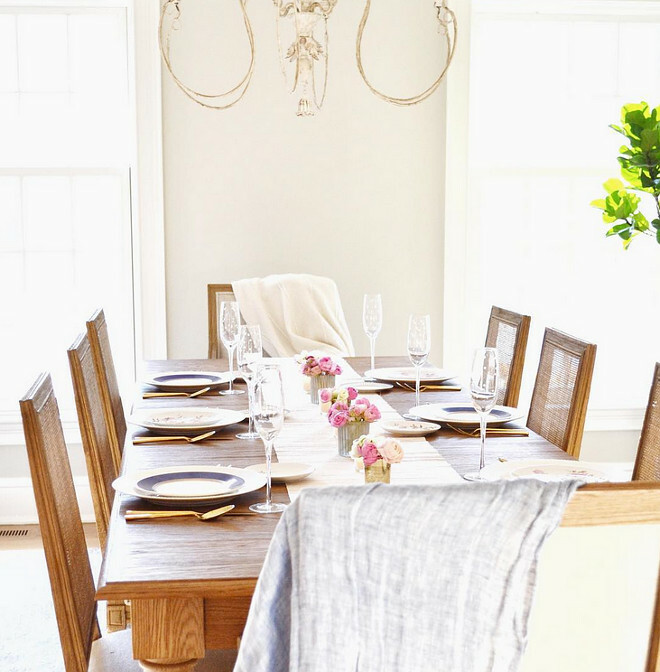 Both the table and chairs are from Restoration Hardware. The table is the 60” Salvaged Wood Trestle Rectangular Table. Madeleine Chairs in Weathered Oak. 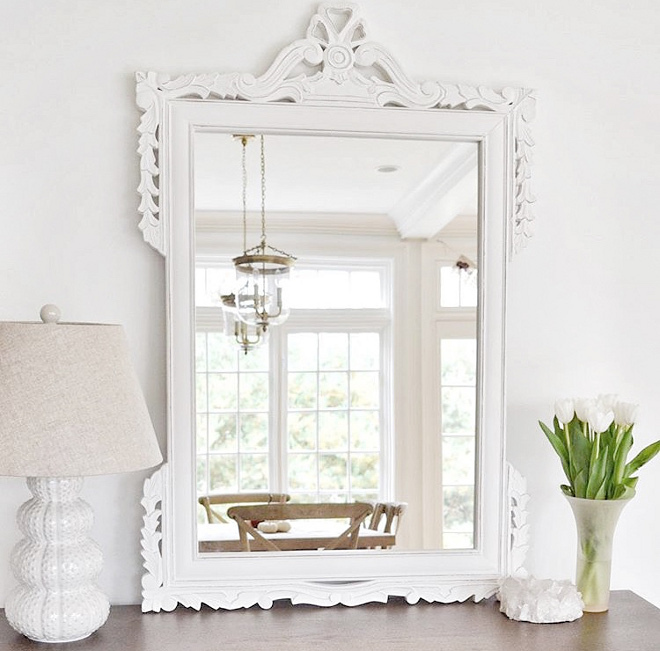 The painted white wood mirror is from Overstock and the lamp is from HomeGoods. The original layout of our home had a very long living room that was closed off from the rest of the house. You weren’t able to see the kitchen which was pretty much closed off as well and there was no breakfast nook. There was just one dining space for casual and formal. 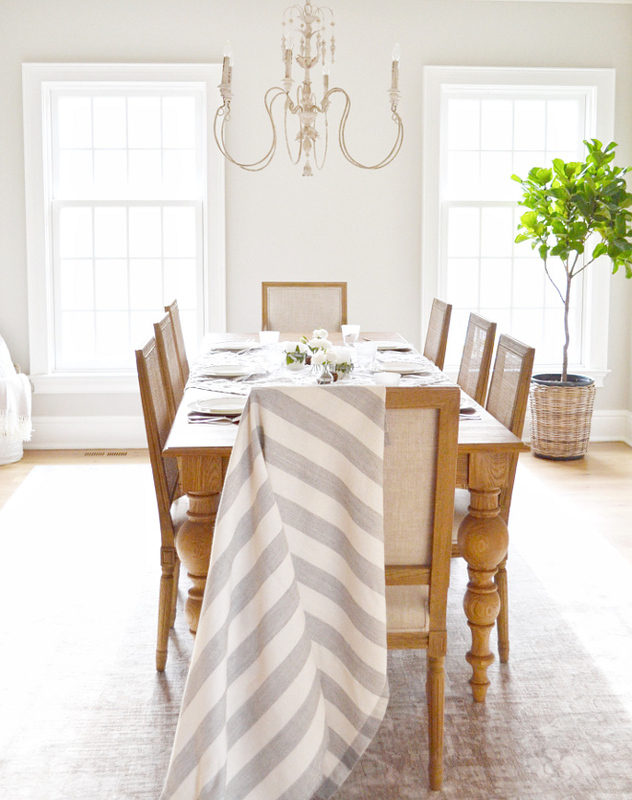 I love a good formal dining room so I had to change things up. Also, the thought of a closed off kitchen and an awkward long living space just didn’t make sense to me. So, we knocked down the wall connecting the living room and the kitchen and created a breakfast area. Instead of fully losing the wall, we turned it into a peninsula to keep the counter and storage space. Best decision EVER! 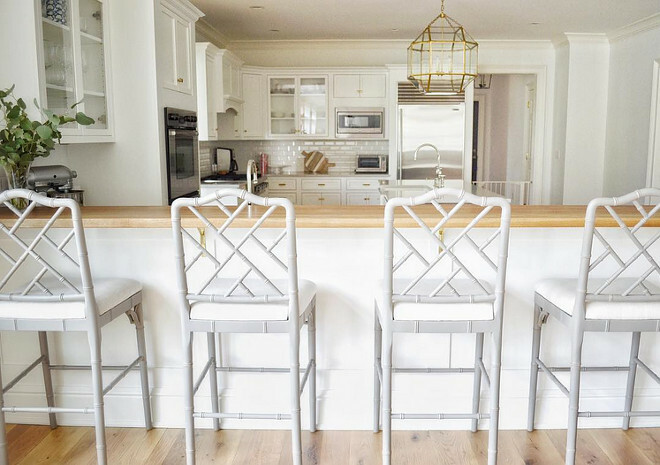 Not only is it open concept but there is so much more light shining into the kitchen and just a better flow to the space overall. Living room furniture is Restoration Hardware and the wall paint color is Benjamin Moore Simply White. I love the contrast with the dark fireplace. 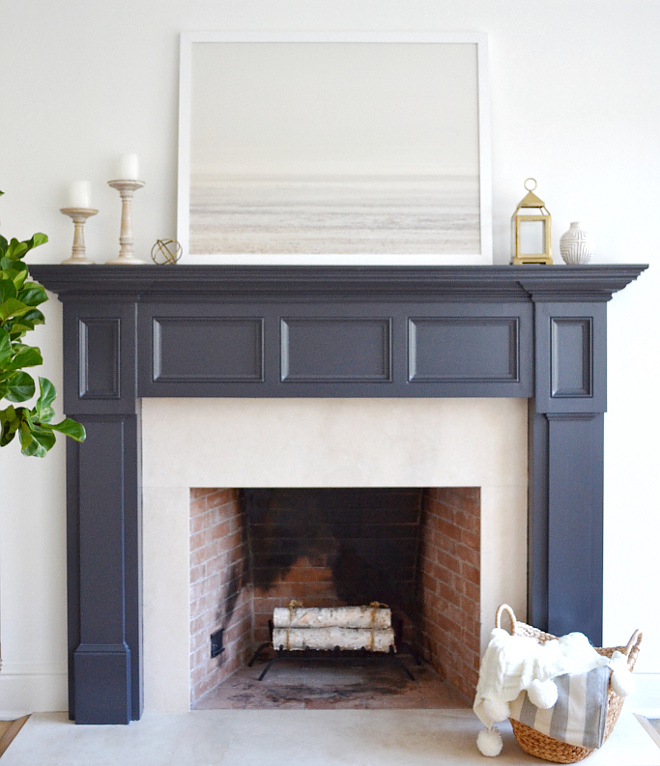 The fireplace paint color is Benjamin Moore Midnight Oil. Art is Patagonian Winter print from Minted. 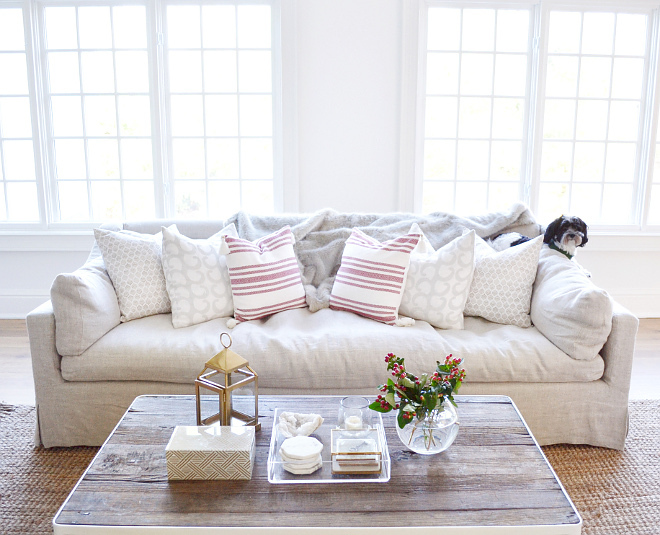 The sofa is the Belgian Classic Slope Arm Slipcovered in 8 ft. from Restoration Hardware. Fabric is Belgian Linen in Sand. Coffee table is the Dutch Industrial Coffee Table in Distressed White. Chairs are Restoration Hardware Marcel Upholstered Club. Fabric is Belgian Linen in Sand. Rug is the Maui Chunky Loop rug in Natural by Rugs USA. 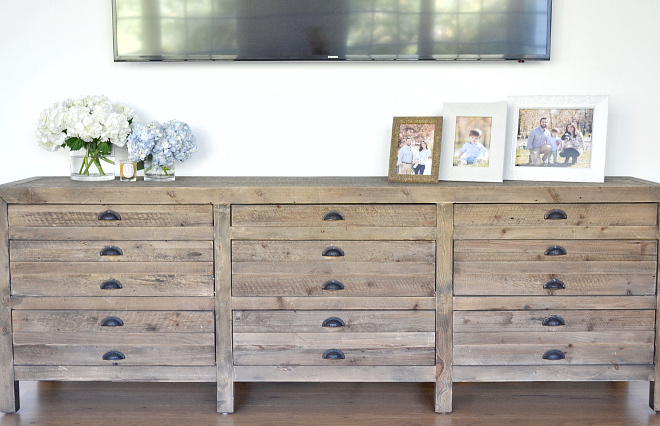 Media Console is Printmaker’s 81”wide in Antiqued Pine from Restoration Hardware. Can a home office get any better than this? I love how serene this place feels. The color palette is perfect! 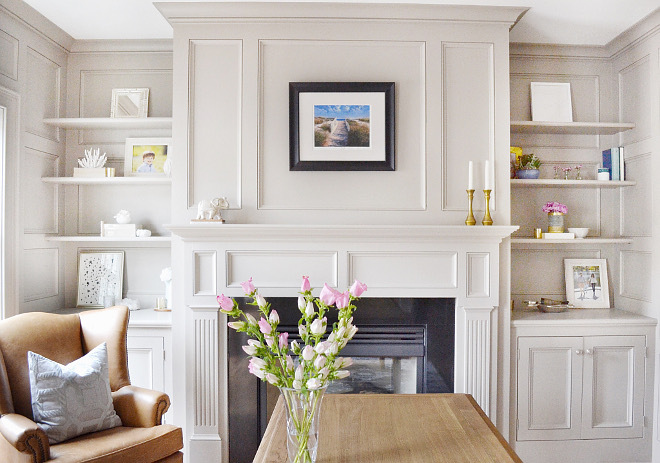 Walls, cabinets and trim are Benjamin Moore HC-170 Stonington Gray. 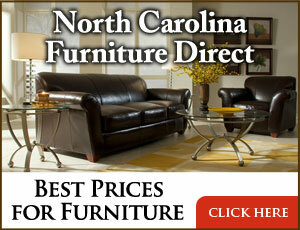 Chair: Thatcher leather wingback chair in Toffee from Pottery Barn. 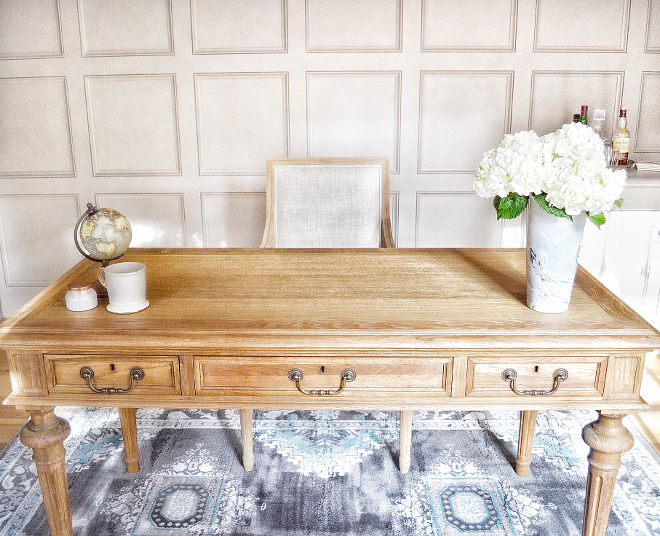 French Partner’s Desk from Restoration Hardware in Dry Oak. Chair is Vintage French Square Fabric in Sand and Weathered Oak Drifted from Restoration Hardware. Rug: Trebizond SM03 Oriental Floral Reflections Rug from Rugs USA. The master bedroom is just like the rest of the house; beautiful, stylish yet not complicated. King size bed is the Haley Wingback in Talc Linen from One Kings Lane. White duvet is from Pottery Barn. Pillows are from Studio McGee. 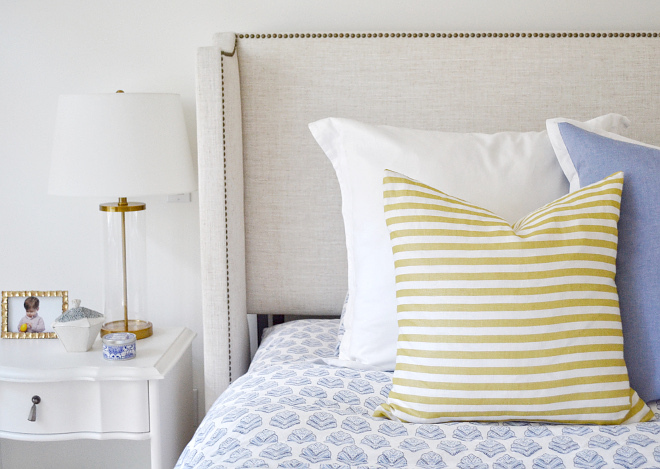 Nightstands are from RH Teen – Jolie Nightstand in French White. 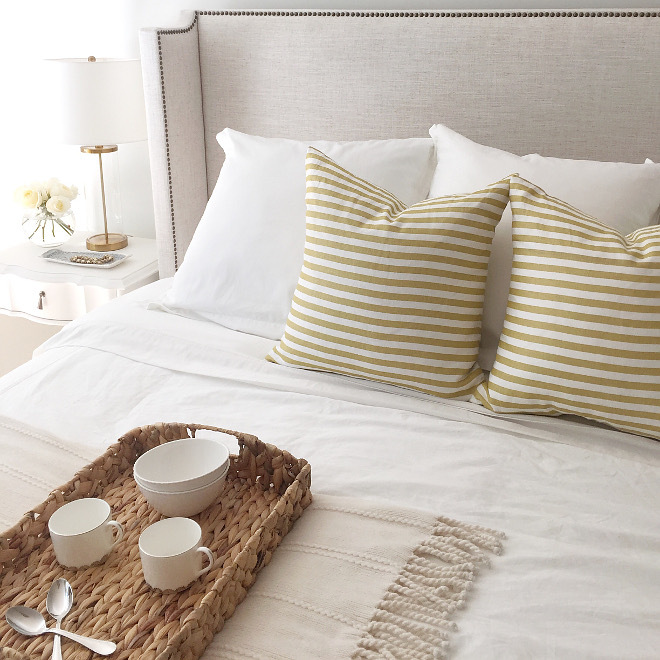 Bedding is from Serena and Lily in Sanibel. 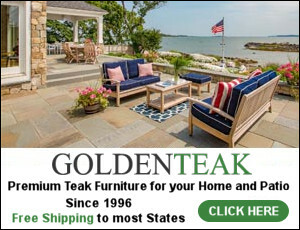 Settee is from West Elm – Elton Settee. Frayed tie-top linen drapery in warm white from RH Teen. 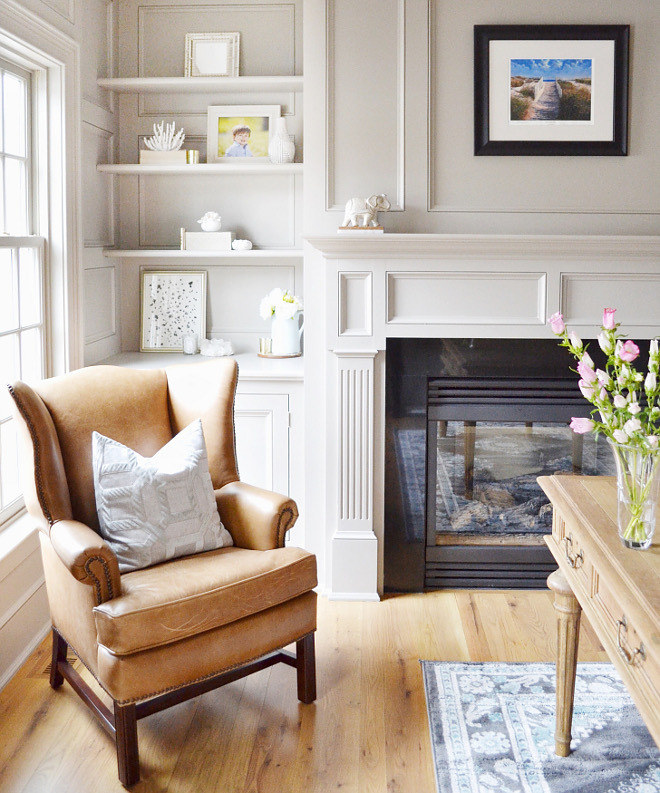 Walls and trim are painted Simply White by Benjamin Moore. Light is Basil Small Hanging Shade in Brass from Circa Lighting. Henley rug in Ivory from Pottery Barn in 8×12. 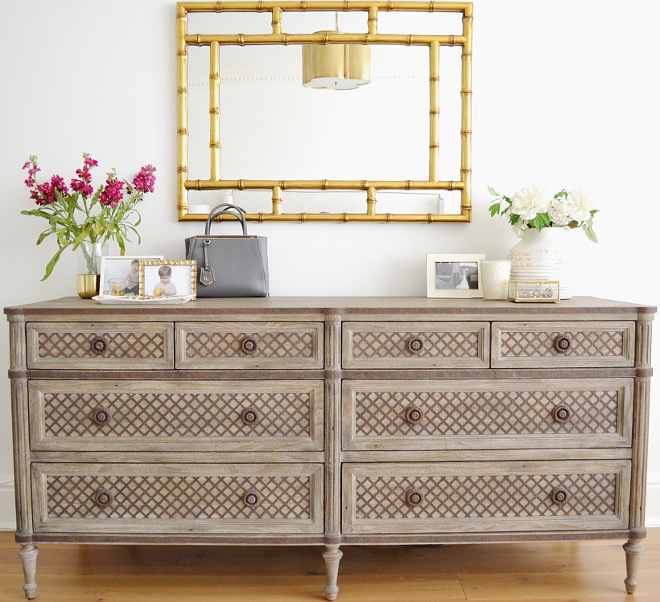 Dresser is the Louis XVI Treillage 8-Drawer dresser from Restoration Hardware in Weathered Pine finish. Headboard has been discontinued by West Elm but many similar ones there. Bedding is from Pottery Barn. Wood tiled nightstands from West Elm. Maui Jute Wavy Chevron With Tassel Rug. Walls are Benjamin Moore Swiss Coffee and trim is Benjamin Moore Simply White. This is the only bathroom we have renovated so far and let me tell you, it needed to be gutted. There were so many shades of brown before, I just couldn’t leave as is. I wanted to tie in navy blue as an accent color and use it for impactful pops throughout various spaces. The paint color here is Benjamin Moore 1624 Westcott Navy and the trim is BM Simply White. 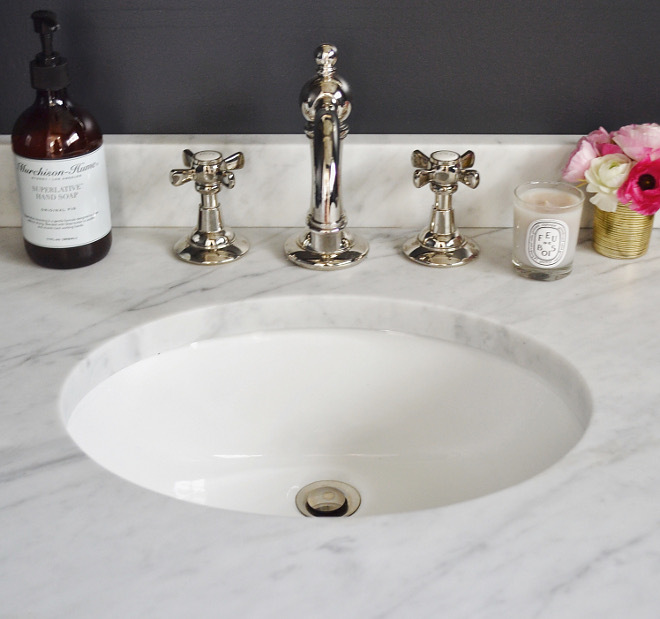 The mirror, and open vanity (Gramercy Collection) are all from Restoration Hardware. The sconces are Thomas O’Brien Bryant Sconce with the plain shade. The ceiling light is the Archer Pendant from Joss and Main. 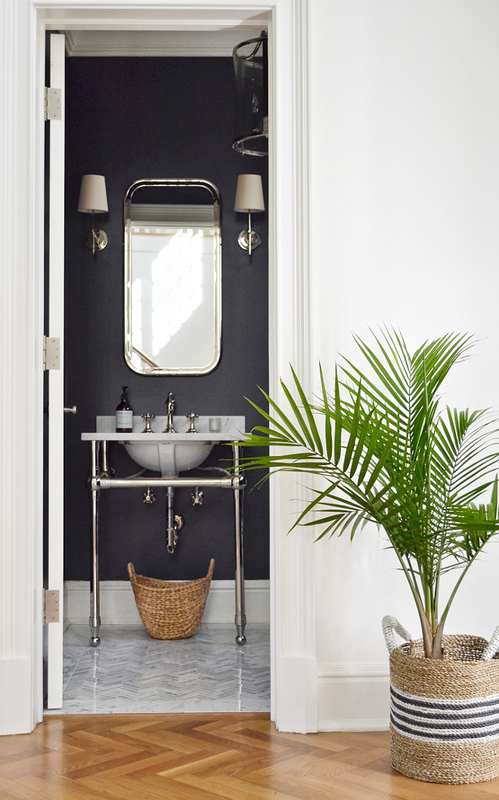 All metals in the powder bath are polished nickel. Faucet is from Restoration Hardware. 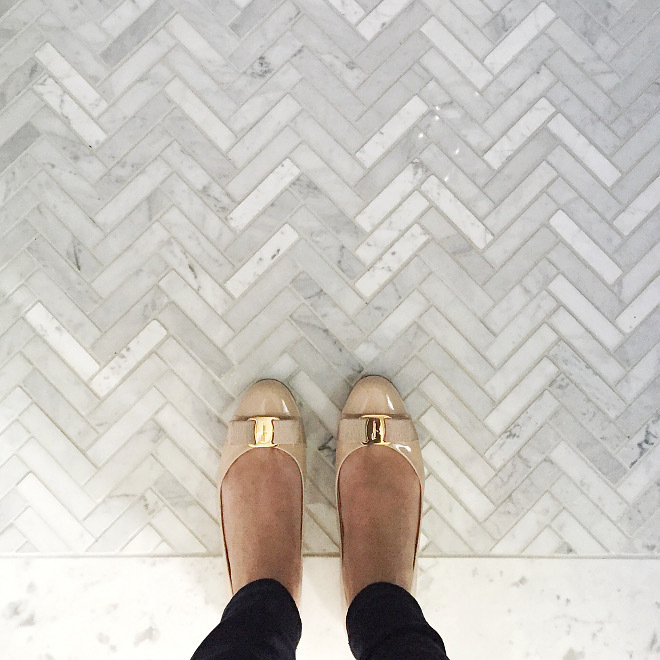 Flooring is Calcutta Marble tile in herringbone with 5 ½ x 24 inch boarder tile. 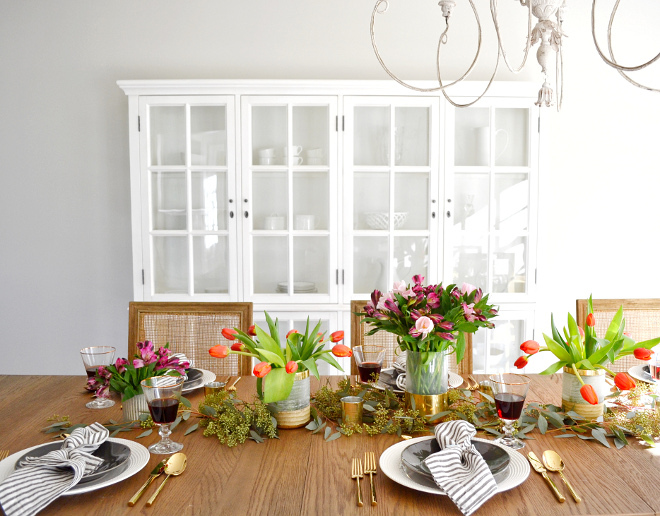 Didn’t you love seeing Irina’s home from @HomeSweetHillcrest? She is such a sweetheart and I truly love how clean and calm her home feels. We’re trying to get the same feel around our house by decluttering it around this time of the year and we often donate what we don’t use anymore. Trust me, 5 people can accumulate things fast! I feel that living with less clutter and cleaner spaces can help us to feel less stressed, not to mention that it takes much less time to clean a house that doesn’t have too much all over. This is my new approach for this year — less mess and less things I don’t use. I prefer spending my time with the people I love instead of tidying up my house day-after-day, after day. Have a Blessed week, my friends. May you feel healthy, loved and complete.